It wasn't until March or so of 2007 that I discovered Pancho's Restaurant in the Habitat neighborhood. It's one of the best at making Mexican food, of which I am a big fan. It has become my go-to to-go fast food joint of choice. Also, it gets robbed a lot. Anyway, what I want to draw your attention to is their sign, at left. It's an expensive-looking sign. You'll notice that it's entirely in perfectly plain English. 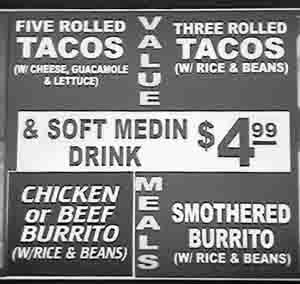 So, it's hard not to wonder what is meant by "SOFT MEDIN DRINK." Is MEDIN a brand name that comes in alcoholic and non-alcoholic versions like hard and soft cider? I just had to ask the cashier what "medin" meant. She explained -- with a look that suggested she thought I was a bit slow -- that "medin" is the English word for the size between a small and a large.